One of my tech pet peeves is the assumption by a lot of app developers that computers are obsolete and everybody wants to do everything on their mobile devices. I LIVE on my laptop and it drives me crazy when I have to haul out my phone or tablet to do something. It particularly bugs me that Instagram has such a poor web interface considering it is one of the most used social media platforms today. While you can view, like, and comment on posts from the people you follow, you can’t actually upload any of your own content. When I first wrote about this post about how to upload images to Instagram from a PC back in December 2015, I didn’t realize how many people were looking for that functionality. However, the post very quickly got a lot of traffic and it has been in my top ten most visited posts since then. I’ve updated the post a couple of times since then to note changes that have happened to the solutions I had written about and to add a note about a new Instagram app for Windows 10 PCs that does everything EXCEPT let you post photos and videos to the service. However, I just discovered that Instagram made a change a couple of months ago that pretty much makes all the other options obsolete for posting photos. What they did was add support to post content from a mobile browser, i.e. a browser app you have on your phone or tablet. But this feature also lets you post from a browser on your computer by using a feature that makes it think it’s a mobile browser. Huzzah! NOTE: This method does not let you upload videos or send direct messages. So far I’ve only tested it in Chrome, where it’s super easy, and Firefox, where it’s a little more complex. Because anybody can get Chrome for free, that’s the option I’m going to detail here, with links to some more info for Firefox. If anyone wants to confirm that this can be done in another browser as well, please share it in the comments below. Also, I’m keeping the older information in the post, after this new section, for people who want to post videos from their computers. Press CTRL + SHIFT + I to open the developer tools frame. You can also do this from the Settings menu by going to More Tools > Developer Tools. Press CTRL + SHIFT + M, or click the Device icon (second from the left on the Developers Toolbar). This adds a small toolbar just below your main browser toolbars that lets you choose a mobile device to simulate. You can also just keep it on Responsive. NOTE: If you click the X on the Developer Tools frame, you’ll lose the device menu. However, you can click the three dots to open the settings and click Undock the frame, which opens it in a separate window. You can then minimize that window to get it out of your way. You now have the mobile browser interface with a normal Camera button that lets you upload images to Instagram. Note that you don’t have scrollbars with this interface; instead you have a round dot that you use to simulate tapping and dragging on a touchscreen. NOTE: If the buttons do not appear, click the Reload button or re-enter the URL in the location bar and they should appear. 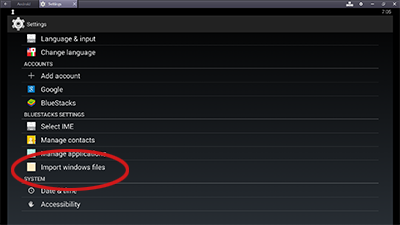 Also, you may need to change the filter in the Browse dialog to All Files to select one to upload. Business accounts don’t let you add a filter to your image for some reason (you can in the app). While the Edit function lets you switch from full image to cropped square, as well as rotate the image, I haven’t been able to figure out how to resize the image to crop it further. There’s no option to edit the caption in this interface as far as I can see. You can do the same thing in Firefox as in Chrome as long as you have version 52 or higher. Just go to Tools > Web Developer > Responsive Design Mode. However, in some cases you may not see the option to change devices depending on whether you have Multiprocess Windows enabled or not. And even if you’ve never touched any setting re. Multiprocess Windows, it could have been disabled by an app. The article below provides step-by-step instructions for re-enabling it if necessary. NOTE: The Firefox interface does use scrollbars. NOTE: I’m posting representative screenshots for each of the options, but I’m not writing out step-by-step directions as I find all of them pretty easy to use. UPDATE: In October 2016, Instagram added a version of its app to the Windows Store to use on tablets. You can also install it on Windows 10 computers, however you cannot use it to upload photos and videos to Instagram unless your PC has both a touchscreen and a backwards-facing camera. It does offer more Instagram options than the web-browser version, though, so it’s probably still worth downloading if you don’t want to use any of the options below. Gramblr is a program whose sole purpose is to upload content to Instagram from your computer. You can download Windows and Mac versions for free from the Gramblr website. You’d be hard-pressed to find a more straightforward interface. There’s a lot of flexibility for cropping your image. Note that you have to click Save before you can move to the next step. There’s a funky Motion feature on the Filters page that turns your still image into a short video by zooming in on it. You can add multiple accounts and switch between them really easily. Having to use a separate app to actually interact with Instagram isn’t ideal. BlueStacks is an Android emulator, which means you can add most Android apps to your computer (although they may not all work exactly the same as on your phone/tablet). You can download Windows and Mac versions for free from the BlueStacks website (scroll to the bottom of the page for the Download button). It creates a display that looks like an Android phone, so you get a sense of what your pics will look like for most people and you can interact with it exactly the same way you would on your mobile device. You can use it to use all sorts of apps, not just Instagram. You can map keyboard shortcuts to different commands, depending on the app you’re using with it. The phone-like display makes it hard to read the text. There are a couple of confusing things in the interface. For example, I haven’t quite figured out how the cropping works yet. Also, to upload files from your computer, you have to go to the Gallery screen and then click on the word Gallery at the top and select Other from the dropdown menu. I haven’t been able to find a way to successfully upload videos. (How you’re supposed to do be able to do it is shown below, but it doesn’t work for me. NOTE: This is the point where you only have the option to upload images, not videos. Bluestacks has a support article that explains how you should be able to upload videos, but I have not yet been able to get it to work. Here’s the basic process: Open Bluestacks, go to Settings, and scroll down to Import Windows Files. That will let you select a video to add to your Bluestacks Gallery. Now when you go to Instagram, you’ll be able to select the video to upload from the Gallery. Unfortunately, for me, when I get to the next screen where you can choose a filter or to trim the video and add a cover image, Instagram closes on me. I’ve used Hootsuite for a long time because it’s a great tool for posting to all sorts of social media accounts, but for some reason I didn’t realize for quite a while that you could actually use it with Instagram. NOTE: You can connect up to 3 accounts (any combination) for free. If you want to use it with more than 3 accounts and gain additional features, you’ll need to use Hootsuite Pro. Set up your Instagram account as a social network in Hootsuite on your computer. Write your post in Hootsuite and add your image or video to the post. Click the Send Now button (or schedule the post for later). You’ll get a message that a notification has been sent to your mobile device. On your phone or tablet, make sure you’re logged into the Instagram account you want to post to. 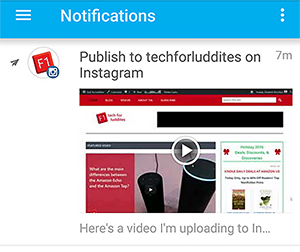 Open your Hootsuite app and go to the Notifications page from the hamburger menu at the top left. You’ll see your post with a note to Publish it to Instagram. Click the notification and then click Open in Instagram. You’ll get a popup to remind you which account you’re posting to. Click the Yes link. The image/video will open in Instagram and you will continue to post it as if you uploaded it from your device. When you get to the final screen where you can add a caption, it will be blank. What you wrote in Hootsuite is in your clipboard, however, so all you need to do is paste it into the box. Make any changes you’d like and click Share to post to Instagram. The first part of the process on your computer is very easy. When you write the text for the post, if you use blank lines they will carry over to Instagram, unlike if you write the caption in Instagram itself. You can schedule posts for later. 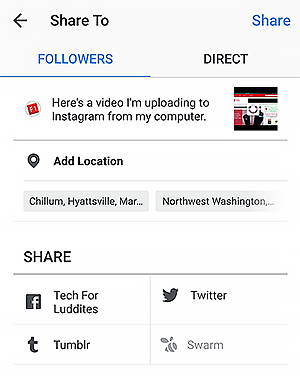 You can manage your Instagram posts through the same interface as your other social networks. You still need a mobile device to post to Instagram, so it’s not a computer-only solution. NOTE: Although the method seems rather convoluted, once you’ve done it once or twice, it’s actually pretty simple. 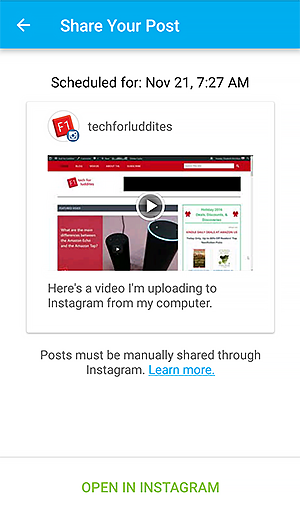 So as long as you do have a mobile device with Hootsuite and Instagram on it, this is a nice way to get your files from your computer into Instagram and then have its full features available to you. UPDATE: Since I first wrote this post, I can no longer use this app. When I try to log in, it gives me an error message that says, “Your version of Instagram is out of date. Please upgrade your app to log in to Instagram.” I sent a note to the InstaPic developers asking for help but never received a reply. I’m leaving up the instructions in case the problem has something to do with my specific setup, although I have seen comments from other people on the app page that are having the same problem. If I learn any more I’ll update the post. InstaPic is an app for the Windows 8 and 10 operating systems. You can get it for free from the Windows Store. It provides most of the functionality of Instagram, including the ability to follow people and manage some Instagram settings, in a Windows interface. You can use it with multiple accounts and switch between them really easily. Even though Instagram now lets you post non-square images, InstaPic currently forces you to crop them to a square format. You can’t resize the Caption box to see your full text. Even worse, you can’t use carriage returns. You can’t edit posts after you’ve uploaded them (or at least I can’t find any way to do so). There seems to be a bug when you’re searching for pictures by hashtag. Even though a list comes up that shows you related tags with a number of posts tagged with them, when I click on any of them I get a message that says “No posts yet.” I’ve actually sent a message to the app developers to see if I’m doing something wrong and I will update this post if I get an answer. Do you have another method for uploading images to Instagram from your computer? If so, please share it in the comments!